In CATI or CAPI you have to assign specific interviewers that will be working on the survey. 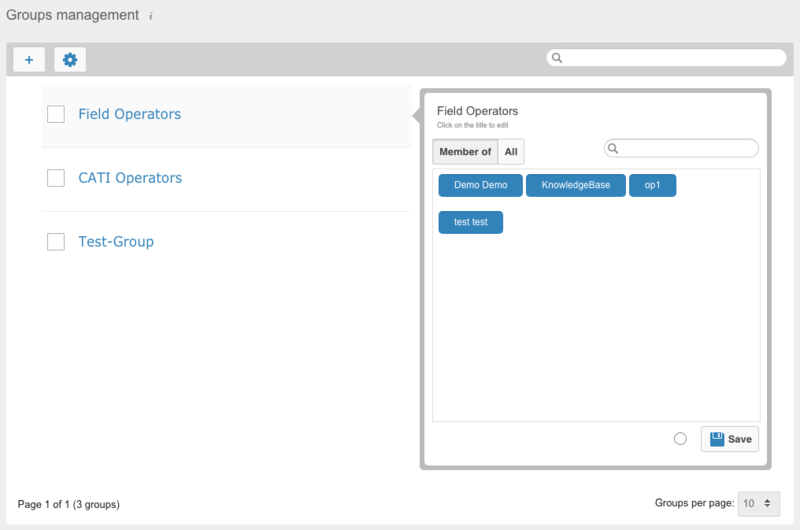 To make this operation as quick as possible, you can create groups of interviewers to simultaneously assign certain operators to the survey, instead of selecting them manually one by one. For example, you can create a group for all interviewers speaking a certain language or a group for all interviewers working in a specific area. To create a group of interviewers, enter section “Group settings” inside “Interviewers” in the survey menu. Click on the “+” button on top left and set the name of the group. Click on “OK” and the group will appear in the list in alphabetical order. Click on the name of the group and select from the box on right the interviewers profiles to include in the group from the “All” tab. In the “Member of” tab you can see the names of the interviewers associated to the group. To associate or delete an interviewer from the group simply click on the name of the interviewer and then “Save” in the box on right. If you want to edit the name of the group, click on the area with the name of the group in the right side of the screen.